LCA studies can be undertaken to meet a multitude of different goals, and often different goals are addressed in one single study. Depending on its goals, the study will have a different scope and level of detail. 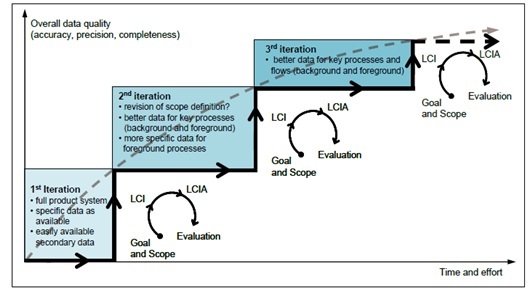 Generally speaking, LCA is an iterative process, as illustrated in the ILCD Handbook (see Figure 6). In the construction sector, LCA studies cannot be completed with the same level of detail as in other sectors. Users such as architects and design engineers require user-friendly tools that can be adapted to the specifics of a building project, and to their needs. An architect during an architectural competition may conduct a screening LCA for supporting his/her design alternative (first iteration in Figure 6), whereas at a more advanced stage of the building project a complete LCA may be required (third iteration in Figure 6). These different iterations will often not necessarily be performed by the same stakeholder. In each case the data, methodology and results need to be adapted to the goal of the study, and to the stakeholder’s requirements. For building assessments, the aim of both screening and simplified LCAs is to simplify the completion of a building LCA study by the practitioners, for example, in the early design stages. Several aspects need to be adapted (e.g. data types and calculation rules) to streamline the LCA of buildings. For example, default values and adapted calculation rules can be used for estimating the impacts of the building components, water and energy consumption. It is also possible to adapt the system boundaries in screening and simplified LCA, for example by omitting details such as joints or individual services during the use stage. In this guidance, as far as possible, for screening and simplified LCA the insignificance or irrelevance of a life cycle stage, or a contributor (e.g. deconstruction activities), or an indicator (e.g. ADP, GWP, POCP) should be justified by the scientific evidence for each aspect (e.g. by a comparison between a full building LCA study and a simplified one omitting one of these aspects). As far as possible, the EeBGuide supports this approach of justified, sound simplification, as shown in previous studies e.g. [Kellenberger 2009]. It enables the LCA methodology for the building sector to be streamlined, while maintaining the precision of the results as far as possible, and adapting the LCA methodology to the needs of the building stakeholders. As a result, the EeBGuide provides mainly guidance on the data types (e.g. use of default values in early design stages) and calculation rules for both screening and simplified LCA. The final choice of omitting life cycle stages or LCIA indicators is left to the practitioner. Note: However, it is strongly recommended that LCA studies be performed with more than one LCIA indicator, and covering several life cycle stages; the results of single-stage or single-indicator studies can be misleading, and the approach does not match life cycle thinking. Issues such as burden shifting can occur, but may not be detected, and it is the core objective of the LCA methodology to obtain a comprehensive view of the environmental performance of a technical system. 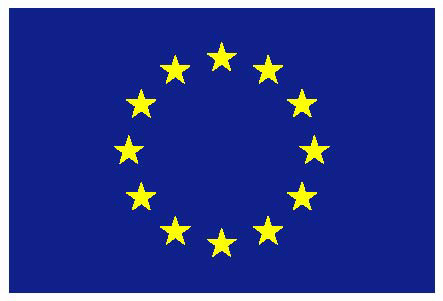 As the EeBGuide is related primarily to energy-efficient buildings and products, the inclusion of at least PENRT (total use of non-renewable primary energy resources) and if relevant the GWP (global warming potential) and PERT (total use of renewable primary energy resources) is strongly recommended. The complete LCA approach is proposed for the more advanced phases of a building project. In this case, precise calculation rules have to be followed, and comprehensive system boundaries have to be used in developing a complete LCA study. The following section explains the different study types in more detail. LCA that covers more than one environmental area of concern. If a practitioner concludes from the goal and scope of a study that the assessment should cover only selected life cycle stages or selected information modules, or that only one single indicator should be assessed, then the practitioner is free to do so. For example, aspects such as specific building components or services can be considered without requiring an in-depth analysis of the entire building. However, under these circumstances such a study cannot be referred to as ‘life cycle assessment’ within the context of this guidance, but should be denoted as a focused assessment. It is strongly recommended that the calculation methods and applicable provisions given in this document be used for the elements selected for assessment, to ensure the minimum comparability for such studies. study focused mainly on operational energy use (B6), in order to show the results of different energy supply systems. study for a facility management company, focusing on maintenance (B2), repair (B3, B4) and operational water use (B7).